The canard - supported by countless United Nations General Assembly Resolutions - that Jewish settlements in the West Bank are illegal in international law - has been dealt a crushing blow with the the recent release of the Levy Committee Report in Israel rebutting that claim. The Committee comprised a retired Supreme Court Judge - Edmund Levy - a Tel Aviv District Court Judge - Tchia Shapira - and a former Foreign Ministry legal adviser Alan Baker. They were appointed by Israeli Prime Minister Benjamin Netanyahu in January 2012 to consider among other matters the legality of Jewish settlements established in the West Bank. That Conference had laid the grounds for the eventual creation of the Mandate for Palestine as part of a Mandate system involving the disposition of vast tracts of territory held by the Ottoman Empire for 400 years - but lost by it following its defeat in World War I.
Whilst Arab self-determination was to occur in 99.99% of the captured territory - the right of the Jewish people to reconstitute the Jewish National Home was limited to the remaining 0.01%. of that territory. “In August 1922 the League of Nations approved the Mandate which was given to Britain, and thus the Jewish people’s right to settle in the Land of Israel, their historic homeland, and to establish their state there, was recognized in international law. Regrettably Judge El-Araby’s sage advice was ignored - as the Levy Report now makes very clear. In one respect the International Court could be excused for failing to consider the Mandate and Article 80 - since the then Secretary General of the United Nations - Kofi Annan - had failed to include these vital documents in the dossier of 88 documents he was required to submit to the Court that were “likely to throw light upon the question” - as he was legally required to do under Article 65 of the Court‘s statute. If you only submit half the relevant documents - you are sure to get only half an answer. Those persons who prepared the dossier of documents and Mr Annan himself now need explain how documents - deemed so relevant by the Levy Committee - were omitted from the dossier submitted to the International Court. 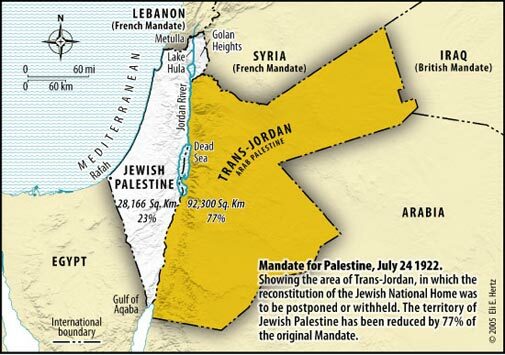 The Levy Committee dismissed the opinion of the International Court that the legal status of this tiny sliver of land between Jordan and Israel - the size of Delaware - was solely governed by the provisions of the Fourth Geneva Convention 1949 - when stating:. “We do not believe that one can draw an analogy between this legal provision and those who sought to settle in Judea and Samaria not as a result of them being “deported” or “transferred” but because of their world view - to settle the Land of Israel.